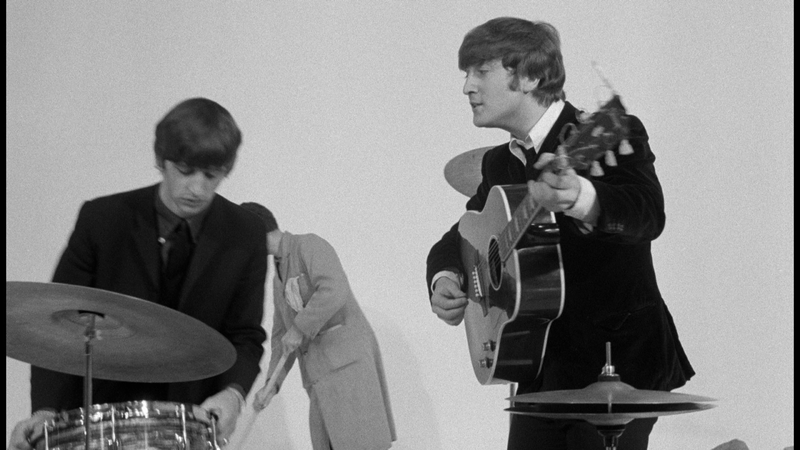 The Beatles are obviously one of the most influential bands of all-time. They have made a massive impact on more than just music but pop culture too. 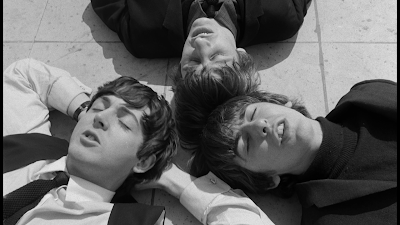 Four men from Liverpool took the world by storm and the brand of The Beatles is still making a ton of money. On the other side of things, I have been a massive fan of the Beatles since the late 1980s. As a teen, the music was influential and seemed timeless. I became a massive fan of Paul McCartney and seen him in concert 3 times. There once was a time where I almost was part of Ringo Starr’s posse when he was in town for a concert. A neighbor to my girlfriend at the time asked her if she knew anyone that would help him out on a security detail for Ringo. They needed someone to sit with him in his limo with him. He asked if she knew anyone. She said she didn’t. We didn’t last much longer after that as a couple. 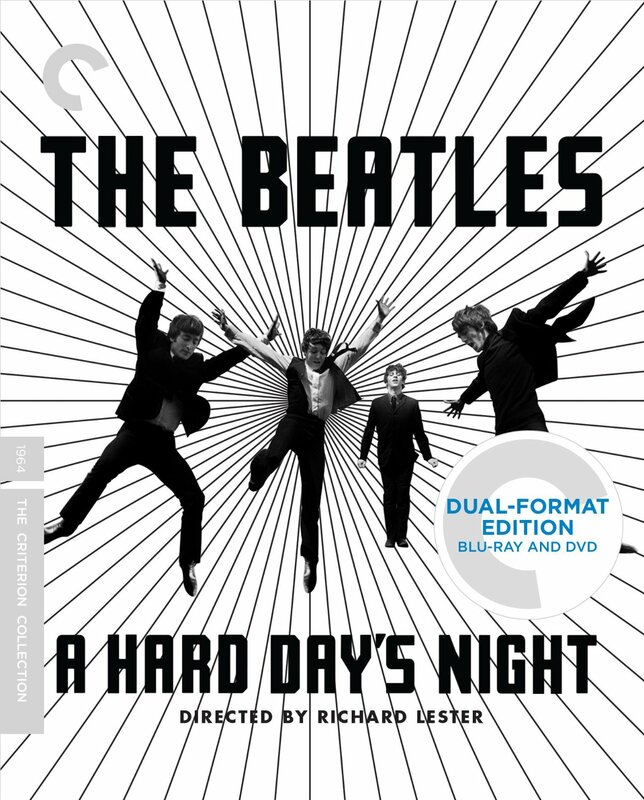 I had never seen A Hard Day’s Night before now. As a “supposed” fan of this group, there is no explanation for this. I have seen all their other movies from Help! to Magical Mystery Tour. I even saw Let It Be and that hadn’t been released. Yet, for some reason, I never got to see A Hard Day’s Night. I even had to order the Criterion Collection Blu-ray because I never even owned it. When I sat down and watched it, I became a little sad because I think I missed something pretty special for my youth. Everyone on the planet Earth, except for me, knows all about A Hard Day’s Night. This is the film that is pretty much a day in the life of the Beatles with a little bit of plot thrown in to the film for god measure. It starts out right the beginning with 3 of The Beatles running down the street from a crazed group of fans. We have seen this shot many times over the last 50 years. It is iconic. They are trying to get on a train to go to London for a television appearance. I said three of the four? Paul is missing. He is in the train station with his granddad John McCartney. John is played by Wilfrid Brambell who is best known to us as Albert Edward Ladysmith Steptoe from Steptoe and Son. 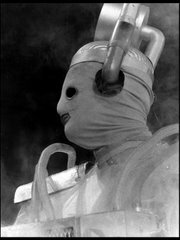 By the time the film was made, Brambell had already become a household name for appearing in the BBC series. They all get on the train and make the journey. Everything on the train is wonderful. Its actually interesting to see this so long after I have seen the members appear as themselves elsewhere because writer Alun Owen nailed The Beatles personalities perfectly. It feels like a conversation the four of them are having and a film is just crafted around them. 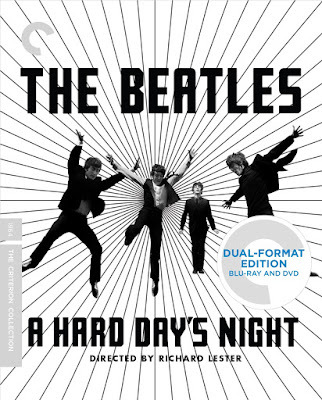 Occasionally in the film they break into song which of course is album A Hard Day’s Night which is pretty awesome. The lip syncing isn’t perfect but it is wonderfully shot where it doesn’t matter. Everything about this film is simply fun. Once the action gets to London, the plot shows up. I make that sound like a criticism but it really isn’t. The train ride is basically the Fab Four walking around and we see what kind of situations they get into depending on who else is on the train. It really is enjoyable. 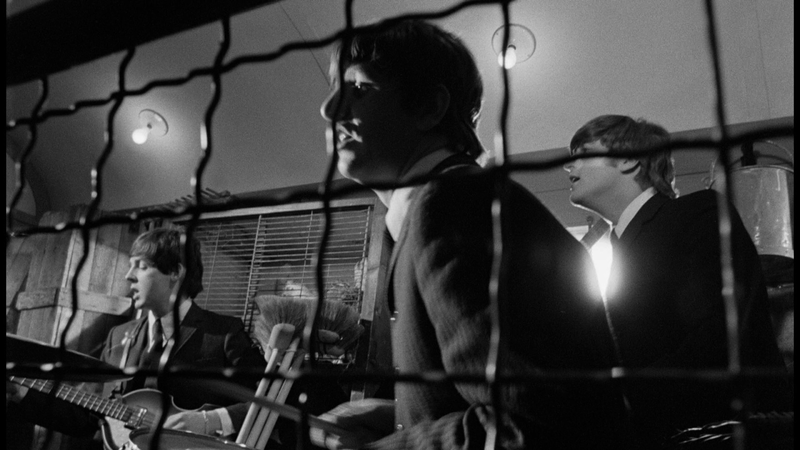 In London, we see The Beatles sneak out to go to a club, rescue Paul’s granddad from a casino and the next day as they get ready for their broadcast, they go into a reception where they are interviewed by many people. Basically like some sort of press party. This is a famous sequence where the press asks them all-sorts of questions and they give some very oddball responses. Basically, it’s The Beatles taking the piss out of the press party and it’s a blast. Reporter: What would you call that hairstyle you're wearing? Ringo: Um, no. I'm a mocker. Reporter: Do you often see your father? Paul: No, actually, we're just good friends. 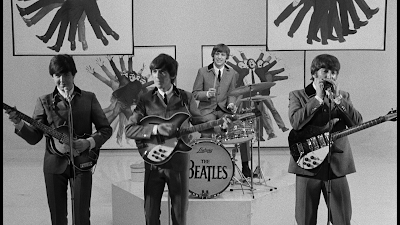 As they edge closer to their live broadcast, things start to happen such as the Fab Four sneaking away from the theatre and start exploring, running around. We get the famous sequence to “Cant’s Buy Me Love” where they are jumping and we get a lot of really cool shots of a very unique time. Once again, this is iconic. It is so cool to see this in context. Just as they get back to the theater, Granddad McCartney starts filling Ringo’s head with all sorts of things about him doing his own things and to live his own life. He thinks Ringo is treated poorly by everyone and he should do something about it. In fact, that is exactly what Ringo decides to do. It’s unfortunate he decides to do this prior to this live broadcast. Granddad McCartney is constantly being referred to in the film as being “so clean” which is a take off from his alter ego on Steptoe and Son with Harold crying to him all the time “youre a dirty little man”. 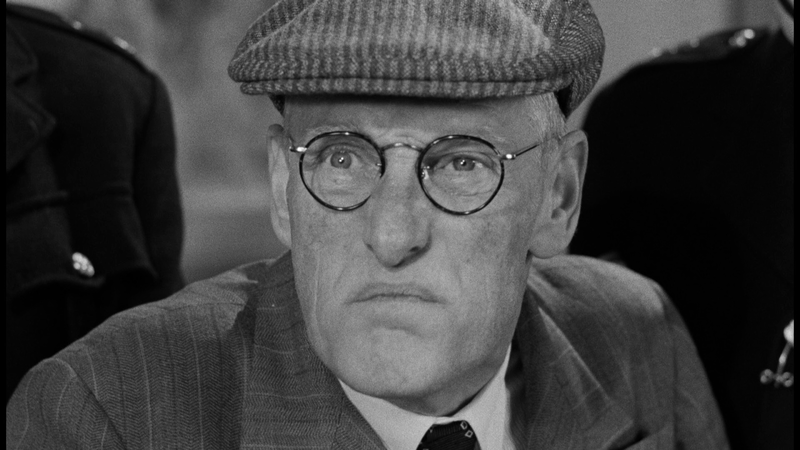 The thing about John McCartney (which John is Paul’s actual first name) is that he isn’t actually too far from Steptoe. The only difference is that he is a little more refrained but that really is about it. John McCartney is a trouble-maker. Trying to talk people into things or just giving them a sly (Steptoe –like ) look when they talk with him. He is constantly going after Ringo about his nose. In fact a lot of people do. Granddad McCartney: It's your nose, you know. Fans are funny that way, they take a dislike to things. They'll pick on a nose. 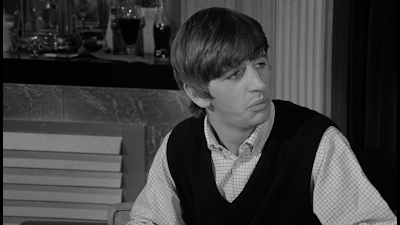 Ringo: Aw, you pick on your own. While Ringo is out to explore the world, he needs to dress down so the screaming girls won’t recognize him. He looks a little more like a vagrant and becomes a bit of a klutz. The problem with that is although it is just human nature, a constable starts to think he is a trouble maker. The police man that follows Ringo around and eventually nicks him is palyed by Roger Avon. Avon had made a career of playing Policemen on TV and film including the BBC Benny Hill, Vacation Playhouse, Sergeant Cork, The Cuckoo Patrol, Harry Worth, Dr. Finlay’s Casebook, My Partner the Ghost, On the Buses, Bachelor Father, Mutiny on the Buses, Dead of Night, Yus My Dear, Sykes, Second City First, and of course two episodes of Steptoe and Son: The Piano and Any Old Iron. Like I said, Ringo gets nicked and put into the police station but so does Granddad! He is brought in for selling forged autographs of The Beatles. His own grandson! Of course he can leave the police stations when he likes but doesn’t know it and creates an elaborate disturbance so he can run away while the Police Sergeant just kind of looks at him. As Granddad gets back to the theater, everyone is in a panic because everyone is looking for Ringo. Once Granddad tells everyone where Ringo is, you would think the rest of The Beatles would sit back and have someone else go get him since there is hardly any time before their concert. Wrong, they leave to retrieve him. Once they get to the station, they do something to try and get Ringo out and next thing we know, about 10 Police officers are running after them. All the running around does get a bit too Benny Hill for me. The only thing I felt was a little off in this film was during this sequence “Can’t Buy Me Love” is played again. It seemed a little repetitious. Eventually everything is good and they get back to the theater in time for their concert and in time for the live television broadcast. All is well. 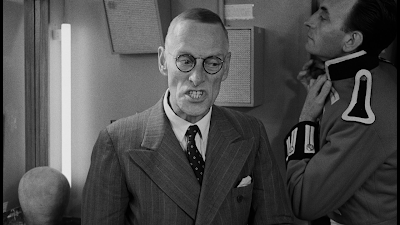 This film even has David Langton from Upstairs Downstairs and even Jeremy Lloyd who is uncredited but I recognized him immediately. Unlike what we see with Help! 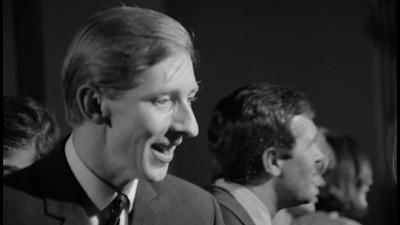 later, A Hard Day’s Night is not a story with a villain. It’s more of an expose on a day in the life. There isn’t a villain. The closest we get to is a protagonist of their manager Norm. He is not a bad guy but needs to keep them on task. Watching them, it is easy to see that they wander off very easily or lose interest on a whim. Norm kind of comes across as someone who has to control them and is almost like a parent but also has an inferiority complex especially about his own height. Something Granddad plays into during the film. 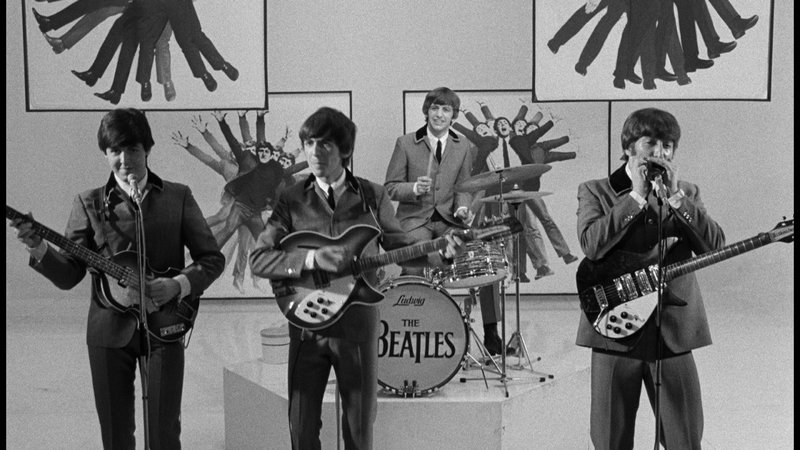 The most interesting aspect of the film are The Beatles themselves. As I mentioned above, it captures their personalities. I have no problem believing this I what they are really like in person. It obviously is such a blessing that all four members have not only amazing personalities but they are naturals on film. 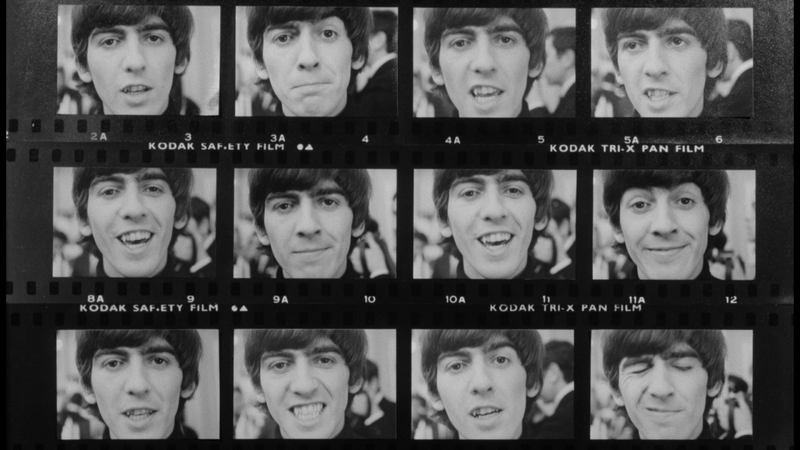 Just as I think George is the least gregarious in front of the camera, he will say something or do something that is funny. It really is crazy how they just worked out perfectly. I feel like I missed out not seeing this as a kid. I think part of the problem is that I would have rather watched The Beatles movie that was in colour over the one in black & white. A view I do not hold these days or for decades. The movie is decisive and creative. This would have influenced me a great deal from how it was made and how visually stunning it is as a kid. I love the closing credits with all the pictures of The Beatles. They were perfect for the camera. This was a lost film for me. One that passed me by and now as I am older, have enjoyed it but think if I were to only watch one of the 2 Beatles films again I would have chose this one without any hesitation. While Help! is very enjoyable, it plays like an episode of Gilligan’s Island. The crazy villain played by Leo McKern is trying to get the ring off of Gillgan’s….I mean Ringo’s finger. In A Hard Day’s Night, it is real. Yes, it is a comedy with over the top situations like the car thief who keeps getting interrupted by the chase sequence and eventually decides to not care to break into the vehicle but the film is grounded in truth. It’s very true that the Fab Four were chased everywhere they went. This was Beatlemania and it was only going to get bigger. Watching this film, for me, was like opening a wonderful time capsule; a window into a time that no longer exists. It is easy to see why this film inspired so many people. It’s a product of its time in a good way. It’s a sweet innocent view of these 4 lads from Liverpool before the mega fame, before the break up and never-ending lawsuits and before they aged and for some of their deaths. This was The Beatles when they were forever young. Next week: I am going to take a look at the 1977 BBC version of Count Dracula. Produced in the standard way the most BBC series were made at the time, I think this version of Count Dracula is one of the most wonderful adaptions every made and one of the most creative. Greg, I love your account of finally watching this movie. I had no idea you were also a Beatles fan (I am, and also have been, since the 1980s)! 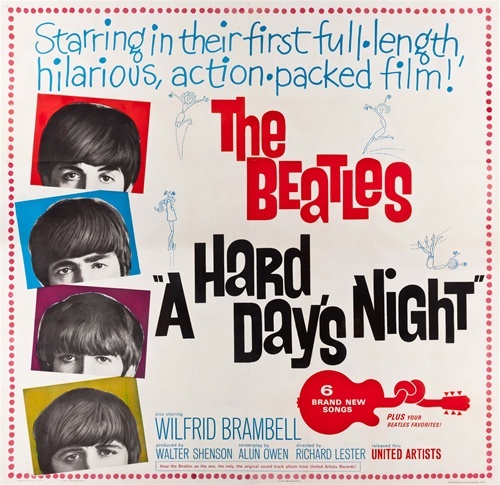 I was lucky enough to watch Hard Day's Night on the big screen once about 10 years ago, in Madison, WI, with an onstage introduction by Roger Ebert, who also greatly admired the film. Thanks for the review! Yea, I am a massive fan of The Beatles and everything about them. Seeing A Hard Day's Night like you did sounds like a real thrill. That must have been fun. I'm jealous!